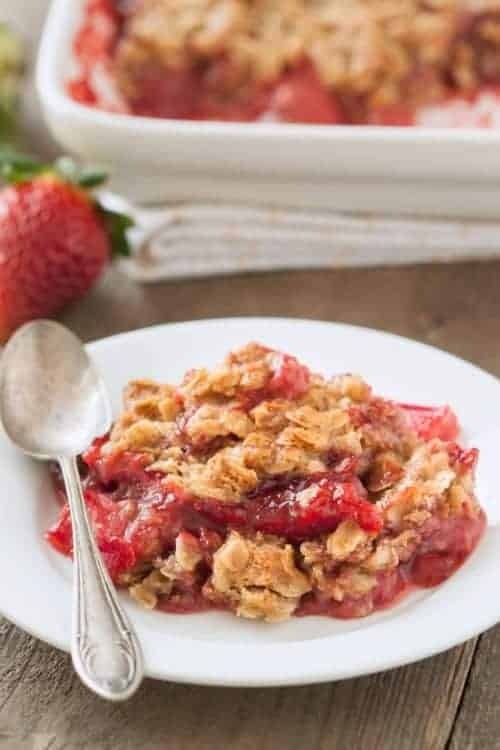 This quick and easy gluten-free strawberry rhubarb crumble is generously topped with a simple oat-based streusel and is the perfect spring dessert! I’m super excited to be posting this crumble today as it’s one of the first recipes I’m sharing from my new cookbook, The Sweet Side of Ancient Grains! It’s coming out next week and is all about 100% whole grain sweet treats. All of the recipes are created so that you can’t tell that they’re whole grain, which is especially helpful when you have stubborn kids or spouses who, like me, don’t like the taste of whole grains! Several different ancient grains like buckwheat, quinoa and spelt are used throughout the book and all but a handful of the recipes include the option to use more common whole grains like white whole wheat flour or oats should you not like or have access to the ancient grains used. There’s also a good deal of gluten-free recipes in there, like this gluten-free strawberry rhubarb crumble. I always try to make recipes dietary-friendly when possible so I tested this crumble with coconut oil for a dairy-free and vegan version and it’s just as delicious! Today’s recipe was adapted from a plum crumble in the book but with it being spring, I felt like a strawberry rhubarb version was in order. If you can’t tell by the pictures, this crumble is pretty topping heavy – just the way I like it! You can easily use 50% more fruit if you want it a bit more balanced. And if rhubarb isn’t your favorite or if it’s not in season, just use more strawberries or another fruit. Just note that the baking time will likely be different. 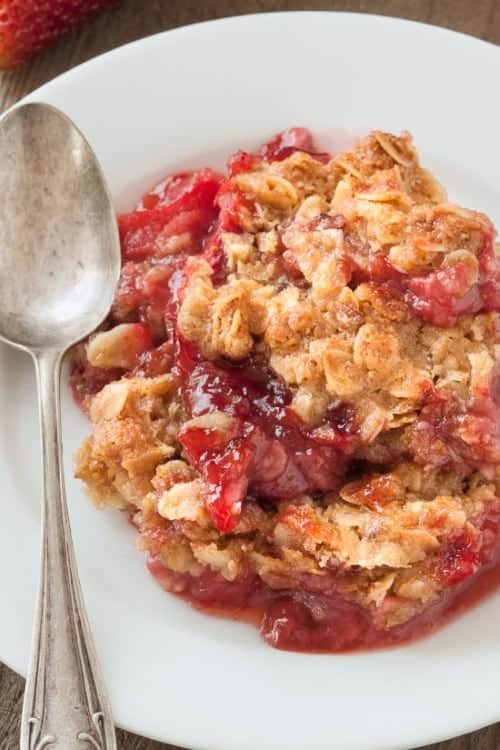 The plum version of this crumble only takes 25 minutes, while the strawberry rhubarb version took 40. 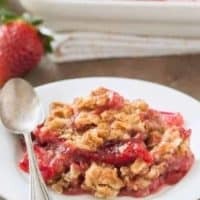 I was assuming that the tartness of the rhubarb would require that I add a little more sugar than most crumble recipes, so I took a gander at some other strawberry rhubarb crisp and crumble recipes. Most of them used double or even more sugar for the same amount of fruit that I used here. My strawberries hardly had any sweetness to them and I still found 1/4 cup to be enough. All that topping helps sweeten things quite a bit! When baking anything with berries, I almost always add some lemon zest and extract but I thought I’d try something different with this crumble and added some almond extract. It adds a little something special, but lemon or more vanilla extract would also work! Want to make something for a gluten-free friend but don’t want to invest in expensive gluten-free flours? This is the recipe for you! You just need some gluten-free oats and you’re good to go. For more delicious gluten-free recipes, be sure to check out these Gluten-Free Samoa Cupcakes and these Gluten-Free Lava Cakes! Preheat the oven to 350°F and grease a 1-quart, 8"x8" or another similar sized baking dish. In a large mixing bowl, stir together the sugar, almond extract, vanilla extract, cornstarch and salt. Add the chopped fruit and stir to coat in the mixture. Let sit for at least 10 minutes while preparing the topping. In another large mixing bowl, stir together the oat flour, oats, brown sugar, melted butter or coconut oil and salt until well combined. Spoon the fruit mixture into the pan and top with the topping. Place the dish on a baking sheet to catch any spills. Bake for 40-45 minutes or until the topping is firm and the fruit is bubbling. The topping will appear to be quite runny around 25-30 minutes but firms up in the last 10-15 minutes of baking. The filling may also appear runny while warm but thickens as it cools. Let cool for 30 minutes and serve warm or room temperature. Cover and store at room temperature for up to 2 days. * To make oat flour, grind rolled or quick oats in a coffee grinder or small food processor until it resembles flour. ** For a dairy-free or vegan version, use coconut oil. If you need this to be gluten-free, make sure all your products are certified gluten-free. Disclosure: Links within this post are affiliate links.